The report states that Karnataka topped the list with 37 attacks against Christians. 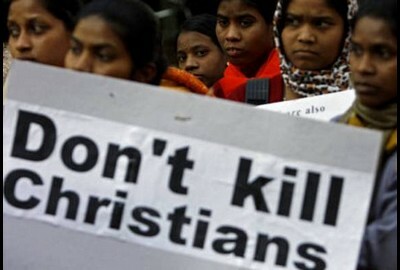 Mumbai: A Christian group has released a report comprising 131 instances of Christian persecution in the country in 2012, claiming most attacks were led by Hindu organizations. The annual ‘Christian Persecution Report’ is issued by Richard Howell of the Delhi-based Evangelical Fellowship of India. president of Indian Christian Voice, in Mumbai yesterday. The report states that Karnataka topped the list with 37 attacks followed by Chhattisgarh (21), Madhya Pradesh (18) and Maharashtra (5). “Hate crimes against tribal Christians are compounded by police apathy. If the police could drive out gangsters like Dawood Ibrahim and Chhota Rajan, can they not stop these Hindu fanatics?” Mathai said. The program was also attended by Mahatma Gandhi’s great-grandson Tushar Gandhi. Tribals from Jawhar, Mokhada and Wada in Thane, Maharashtra, were also invited to give testimony of attacks in the state. However, on questioning, the officers at Jawhar and Mokhada police stations refuted allegations of complicity. “In 2012 not one complaint of violence on Christians was received at Jawhar, which encompasses 52 gram panchayats. These allegations are part of baseless propaganda,” an official said. The Mokhada police said an offence was registered against a dalit faith healer who claimed to pray and cure dreaded diseases with sips of mineral water. “He was a dalit, not a Christian, and was booked under the Drugs and Magic Remedies Act. Wealso registered a case against the villagers who assaulted him after being cheated. No one is allowed to take the law in their hands,” an officer said. John Dayal of the All India Christian Council, who helped compile the report, said incidents of violence were down from 140 in 2011, but cautioned that “many incidents go unreported”. “This dip may not necessarily mean that the incidence has reduced,” he added. The Catholic Secular Forum also said Hindus disrupted a prayer meeting of 600 people in Sawantwadi on January 11. 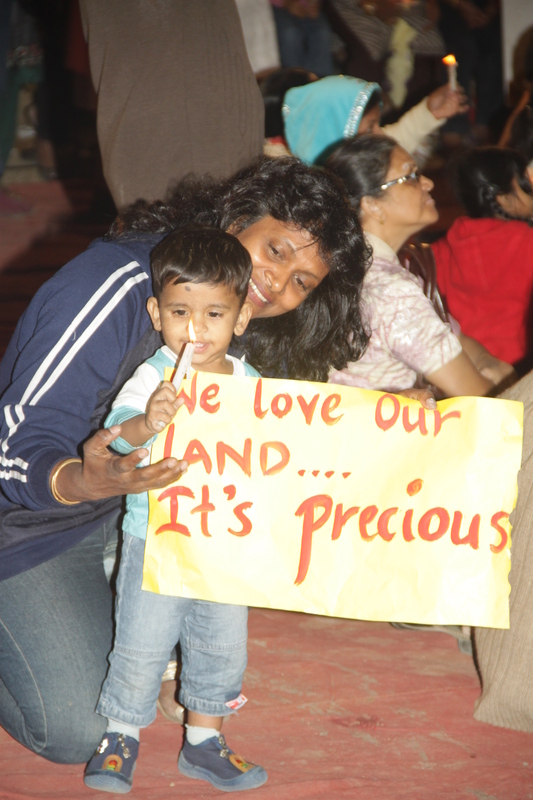 SOUL – Save Our Land; in EXAMINER. In the not too distant future I forsee the title of this article becoming an oft-repeated “mantra”, on the lips of each and every parishioner of Mumbai. In the recent past, there have been instances of mostly Catholic Church property being targeted for acquisition of land for grand social development programs ( St. Andrew’s and St.Peter’s, Bandra; St Vincent de Paul Church, Chuim; Our Lady of Health, Sahar; to name just a few ). 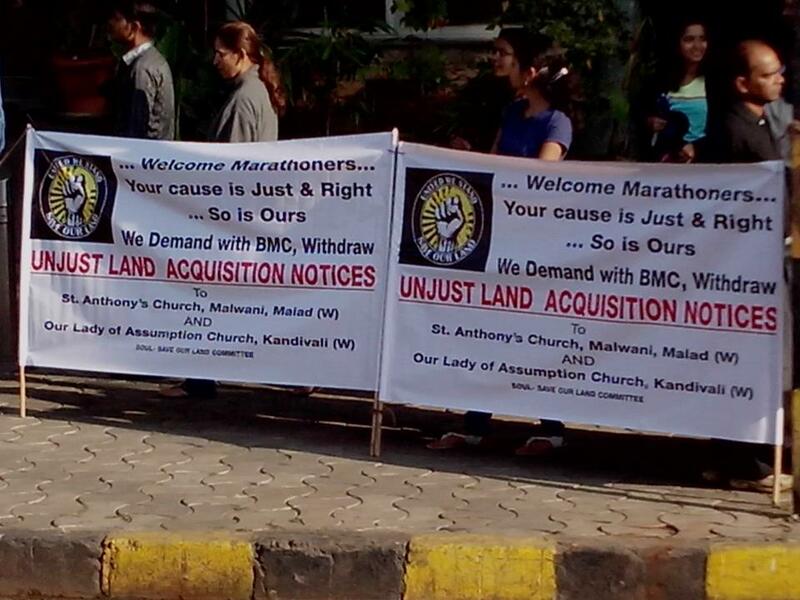 Last year Our Lady of the Assumption Church ( OLAC ), Kandivli West, and St. Anthony Church ( SAC ), Malwani, were the latest victims of this Land Acquisition Pogrom. And just a few days ago Our Lady of Fatima Church, Kirol, Vidyavihar, was in the news for the same reason. These are not one-off occasions, but a well planned strategy aimed at soft targets. But little did the BMC realise that they have awakened a sleeping giant. Events have proved that a sustained and determined effort have helped us to save many of our church properties in the past. The details of the problem faced by OLAC appeared in The Examiner issue dated Nov. 03, 2012. The SOUL committee was formed to tackle this situation with non-violent war-like strategies. SOUL took on a life of its own when SOUL Malwani was formed last month. A brief history of SAC and their problem. 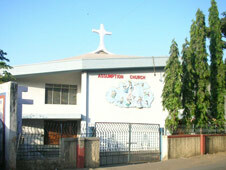 SAC and OLAC shared a common Mother Church, Our Lady of the Assumption Church, Magathane, in the early years of 1600 AD. St. Anthony’s Parish was founded somewhere between 1630-1642 AD. Two sister parishes linked by historical ties reaching back nearly 400 years fighting injustice on a common platform – SOUL ; ironic isn’t it ? SAC and the Parochial house were built somewhere in 1872. 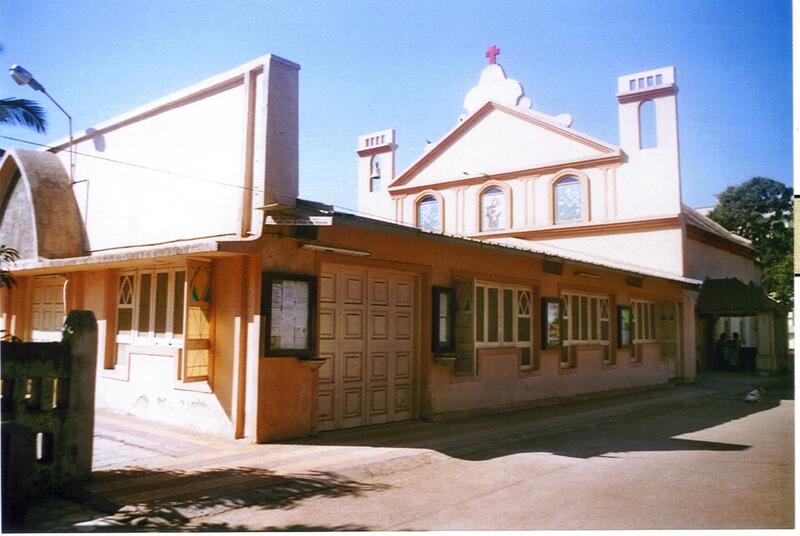 In fact St. Anthony Church, Malwani, and the precincts have been listed in the proposed Heritage Grade II A list. The Development Plan (DP) states that a 90 feet road has to be laid along the entire Malad-Marve stretch. For this the SAC has been asked to surrender an ENORMOUS chunk of land which will lead to the demolition of the age old Parochial House, the St. Anthony Grotto, century-old trees and Church and School land. The new compound wall will be just a few feet away from the Church altar and the School entrance. Envision this – Parishioners will have to wear ear plugs during mass to drown out the sound of traffic, thus effectively drowning out what the priest is saying too ; children tend to rush out en masse after the final bell is rung and they spill out onto the oncoming traffic ( imagine the consequences of this day in and day out ). This DP dates back to 1971, yes 1971, when the only structure visible was the Church, the old School and the Parochial house . All around there was vacant land. Today the area rivals Manhattan, New York, albeit in an extremely haphazard and frenzied way, with rules and regulations thrown to the winds blowing in from the Arabian Sea. The BMC by law should acquire land equally from both sides of the road, but this is not what is happening. The opposite side of the road has buildings spilling out onto the road and re-development plans were sanctioned left, right and center as recently as a few years back, without logic and without referring to the DP. Now the BMC with their blinkered vision only sees SAC as their redemption to build the road. They have conveniently shifted the center of the road line right onto the church property; so not only do we have to surrender our land for setback, but also land which should have been acquired from the plots on the other side. An extremely raw deal and a glaring injustice ! This would have been laughable if we would have seen this scenario in a B grade movie or pulp fiction novel. But this certainly is no laughing matter for the parishioners of Malwani, the BCS, the SOUL teams and the Catholics in Mumbai in general. To compound the problem further, hardly 200 metres from the SAC, towards Marve/Madh, the whole area is a no-development zone because of INS Hamla stationed there for the security of our country . The land is also rich in mangroves and environmentally very fragile, and any violation of Coastal Regulation Zone (CRZ) and Environment Ministry guidelines is a criminal offence. This begs the question – for what purpose is the land being acquired and who is going to benefit ? ( OLAC surrendered a large portion of land free of cost to the BMC 29 years back in front of the church for road widening purposes, and now that very same land is a free-for-all parking, a public dustbin not cleared for days together and living quarters for immigrant encroachers. Its just going to be history repeating itself. ) Mr. MC of the BMC, where is the justification for acquiring land belonging to OLAC and SAC ???? Are we gonna be silent as always ? NO ! The SOUL teams of OLAC and SAC along with the Bombay Catholic Sabha (BCS) and the parishioners ( especially the youth ), PTA members of the respective schools, advocates and social activists from various parishes, not forgetting the immense support from the former Commissioner of Police, Mr. Julio Ribeiro, organised innumerable meetings with the local Corporators, the DMCs of the local Ward Offices, MLAs, MPs and recently on Dec 20, 2012 with Mr. Sitaram Kunte, the Municipal Commissioner, and on Jan.11, 2013 with Ms. Priya Dutt, Cong MP, to get the problem sorted out amicably. 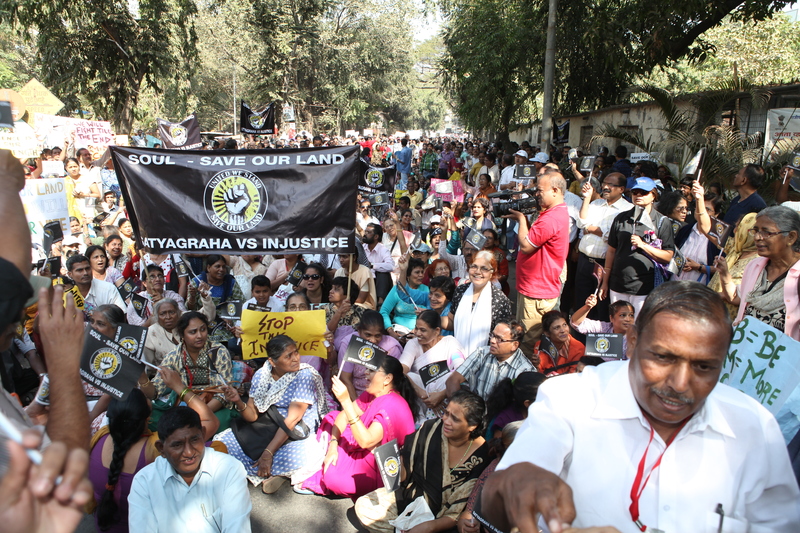 On Dec. 1, 2012, a peaceful protest rally was organised at the OLAC grounds, with over 5000 people making their presence felt. On Jan.5, 2013, a massive Candlelight procession was organised from Asmita Cross on Marve Road and simultaneously from SAC, both culminating at the Infant Jesus Chapel at Kharodi, where the attendees were in excess of 10000, including BCS members from various parishes, parishioners from OLAC, Our Lady of Lourdes Church, Orlem, Our Lady of the Forsaken Church, Kharodi and others. The traffic on Marve Road, New Link Road and the S V Road was in disarray for more than an hour. Not a single untoward incident was reported during these two shows of strength, earning the Catholic Community the respect of the RTO and the Police stations once again. The only question on their lips and the general public was – What is affecting the peaceful and law-abiding Christians so much that they have to come out on the roads to make their voice heard ? This is the same question that we as Catholics have to ask ourselves now ! The Dean of the Borivli Deanery, Fr. Barthol Barretto, was also kind enough to give the SOUL and BCS members a platform at the Deanery meeting held on Jan.10, 2013, to explain and apprise the priests of various parishes the actual situation and the course of action being taken by us, and to caution them to be aware of similar situations arising in their respective parishes in the future. The parishioners of both OLAC and SAC have grown exponentially during the past decade and is still growing at a rapid pace; every bit of land we own has to be preserved at all costs for the future generations. Or there may come a time when Christmas and Feast masses, Holy Week services and other important services will have to be held in rotation throughout the day due to lack of space; a thought to ponder ! The SOUL team is organising a Peaceful Silent Morcha on Saturday, Jan.19, 2013, to the P North Ward office. This will begin at 9.30 am from Asmita Cross on Marve Road and proceed towards Orlem , Mamlatdarwadi and further on towards Liberty garden. 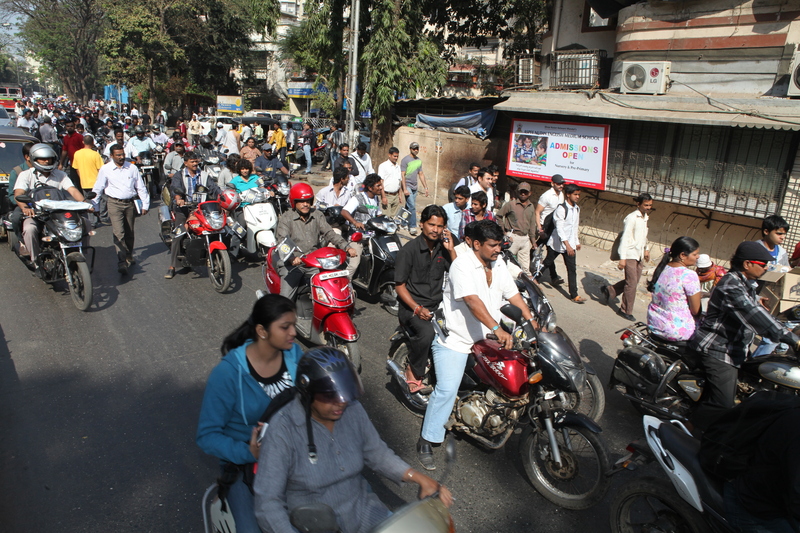 This Morcha will include cyclists, bikers and four wheelers. We earnestly welcome one and all to join in and make it even more of a resounding success that the Candlelight procession. We have to force the BMC to listen and take action and withdraw both the acquisition notices. This Agenda or Program of targeting Catholic Churches again and again and again has to be nipped in the bud and stopped once and for all. Today it is us, tomorrow it could be you ! Let’s do some SOUL searching and be AWAKE, AWARE and ARISE ! Comments Off on SOUL – Save Our Land; in EXAMINER. Comedy movie is about two petty criminals who escape from police custody and end up in a village where they are welcomed as priests. Thiruvananthapuram:The makers of a comedy about two petty criminals who dress up as Catholic priests will be charged with defamation, a Kerala court ruled yesterday. Two actors, along with the director, the producer and the screenwriter of the local hit movie “Romans”, which was released last week, are all named in the suit, brought by a Catholic youth leader in the Kottayam district of the state. The story is about two petty criminals who escape from police custody and end up in a village where they are welcomed as priests. The movie makers face up to nine years in prison for “deliberate and malicious acts intended to outrage religious feeling” and other charges. The Church is not involved in the case, said Father Mani Puthiyidom, official spokesperson of Changanassery archdiocese. “We don’t want to stir up a controversy over the film. We prefer to ignore it,” he said. Jomy Thomas, a Catholic who saw the movie, agreed that it is better for the Church to ignore the issue. He pointed out that one of the actors in the movie is a Catholic legislator. Director Boban Samuel told ucanews.com he never intended to hurt anyone’s feelings or to portray priests in a derogatory manner. “It is a comedy thriller,” he said. The movie was released on January 17 and has been declared a mega hit in the state, earningmore than 20 million rupees (US$372,000) so far. Fr. Austin Norris Showing around Mr. Kunte, Mun. Commissioner. RE: SATYAGRAHA MARCH ON SATURDAY, 19 JANUARY at 9.30 a.m. from Holy Cross, Asmita Jyoti Society, Charkop, Marve Road, Malad WEST to the P/North Ward Office . and Our Lady of Assumption Church. Listens to the presentation made by the SOUL Team on the various issues, injustices in reference to the below mentioned issues. Assures the SOUL TEAM that he would review both the issues and revert to us with his decision. 2] Over 8000 citizens undertake a Satyagraha March from Holy Cross, Asmita Jyoti Society, Charkop, Malad West to the P/North Ward Office. Delegation handed over a memorandum to the Asst. Municipal Commissioner along with the first lot of 40,000 signatures . 3]SOUL Team decides that they will continue their Satyagraha protests till both the issues and the implementation of the Cemetery is not done on a priority basis. 4] SOUL Team / Watchdog Foundation/ Bombay East Indian Association and several other’s organise a Unique protest on Marathon Day, January 20 near Ambassador Hotel, Churchgate. While welcoming the Marathoners, we raised our issues also. 4]Announces the next Satyagraha March on Saturday, February 16 at 10.00 a.m. from Our Lady of Assumption Church, Kandivali to R/ South Ward, Kandivali. PERMANENTLY WITHDRAW NOTICES OF ACQUISITION!!! ST. JOSEPH HIGH SCHOOL GROUNDS. OUR LADY OF ASSUMPTION CHURCH, KANDIVALI. ALLOT LAND FOR CEMETRY ON THE EASTERN SIDE OF THE WESTERN SUBURBS. On December 20th our delegation along with Mr. Julio Rebeiro had met with Mr. Sitaram Kunte, Municipal Commissioner and discussed with him our grievances and our issues. Mr. Sitaram Kunte had assured the delegation that he would do site visits at both the Churches and then convey his decision to us. 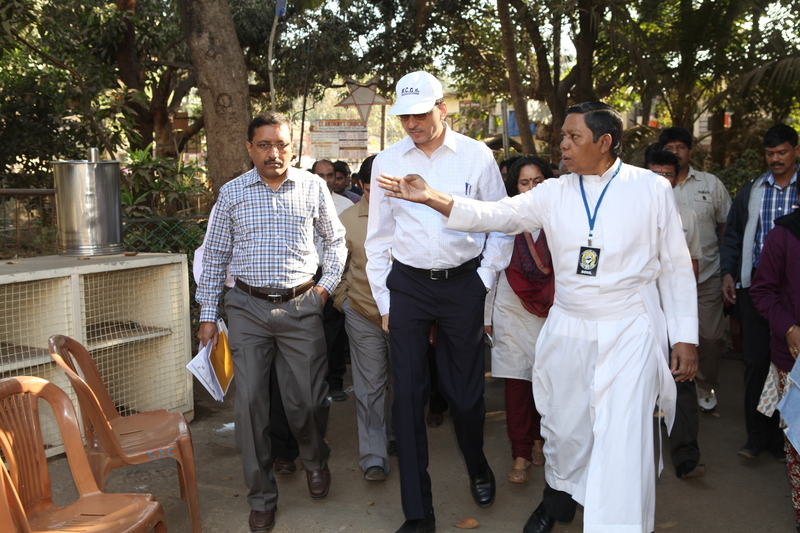 We are happy to announce that on January 19, the Municipal Commissioner, Shri Sitaram Kunte visited both the sites namely, St. Anthony’s Church, Malwani and Our Lady of Assumption Church, Kandivali. Mr. Kunte heard the SOUL delegation on the various injustices done in reference to the above two issues. Mr. Kunte said he would review both the issues and let us know his decision accordingly. Adv. Godfrey Pimenta with Adv. Ralston Fernandes/ Stanley and the others handled the defence brilliantly at St. Anthony’s Church Malwani and likewise Adv. Godfrey Pimenta along with Prashanth Pereira, Lennon Miranda and the others at Our Lady of Assumption Church did a superb job. 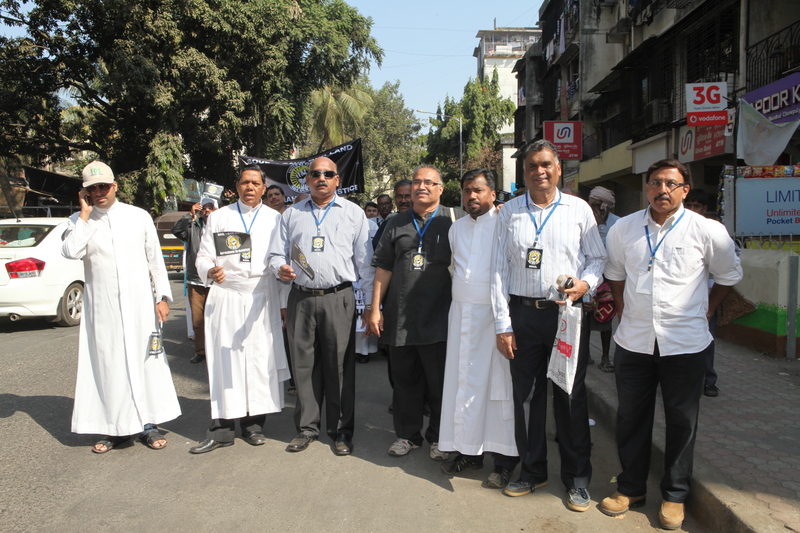 Over 8000 citizens comprising parishioners, members of the The Bombay Catholic Sabha, PTA and people of all faiths and organisations undertook a Satyagraha March from Holy Cross, Asmita Jyoti Society, Charkop to the P/ North Ward Office. The delegation submitted a memorandum along with 40,000 signatures to the Asst. Municipal Commissioner. The Delegation impressed upon the Asst. Municipal Commissioner that we are not against development . However our community is upset by the callous approach of the BMC authorities against such unjust plans of acquiring church lands. Christians have always been treated as soft targets by the Government and the BMC. In the current Road widening, St. Anthony’s Church, Malwani has willingly parted with sizeable parts of their land and Our Lady of Assumption Church, Kandivali in the past has also given sizeable parts of the land for development purposes. Our next morcha is scheduled on February 16 on BMC R/ South Ward , more details will be shared with the Media shortly. The members of the delegation led by the SOUL Team were: Fr. Austin Norris, Parish Priest, St. Anthony’s Church, Fr. Gerald Fernandes, Parish Priest and Fr. Byron Mendonca, Asst. Parish Priest , Our Lady of Assumption Church, Fr. Daniel Fernandes , Asst. Parish Priest, Our Lady of Lourdes Church, Orlem, Fr. Savio, Parish Priest of Our Lady of Forsaken, Fr. Allwyn Misquitta, Asst . Parish Priest, St. John Bosco Church,Borivali, Sr. Gertie, Yucca Gomes, Vice-President St. Anthony ChurchParish Council, Ms Fatima Pereira, Headmistress of St. Joseph’s Primary School, Aurelius Pereira, Chairman, BCS Unit of OLAC , Soul Team consisted of Stanley Fernandez, Greg Pereira, Bernadine Dcosta, Prashanth Pereira, Lennon Miranda, Alex Dmello, Godfrey Pimenta, President –Sahar Citizens Forum, Nicholas Almeida- President- St. John Baptist Church Save Committee, Rashid Azim, President of the All India Milli Council, Mumbai, Activists Anil Joseph, Daphne Warapen and Dolphy D’souza, Spokesperson, SOUL Team. Among the organizations who have supported this campaign are: The Bombay Catholic Sabha, Sahar Citizens Forum, Watchdog Foundation, St. John Baptist Church Save Committee, All Indian Milli Council , Mumbai ,PTA Members of both St Josephs High School & St. Anthony’s High School, Silent Voice, Mobai Gaothan Panchayat , various other NGO’s , citizens and activists. We thank Fr. Barthol Barretto, Dean of the Borivali Deannery and all the Parish Priests / Clergy Team /Parishioners for their support and success of our Satyagraha. Thursday, January 24 at 8.00 p.m.: Meeting of SOULmates and Volunteers at St. Anthony’s Church, Malwani. To review and plan our next moves. Sunday, January 27 at 10.15 a.m. : Meeting at Our Lady of Assumption Church, Kandivali to plan the February 16 Morcha. Soulmates and Volunteers please make sure you attend both the meetings. We also invite all those who are interested in being part of this campaign to join for these meetings. Religious structures deemed illegal by the BMC. 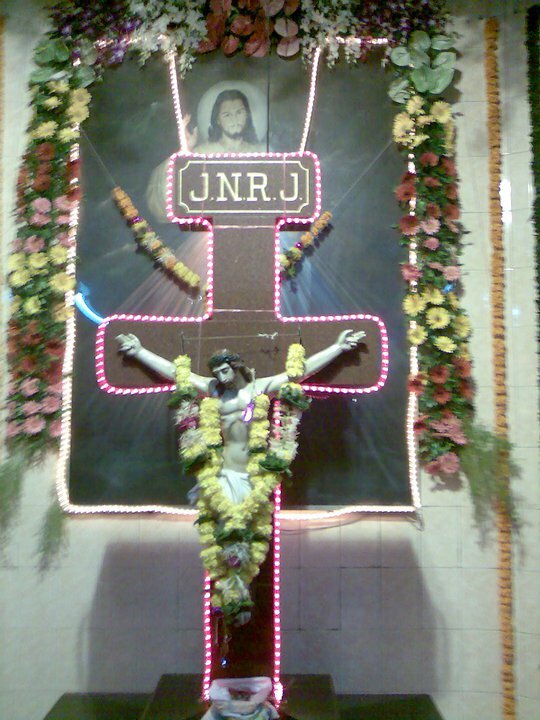 Mumbai: Christians in Mumbai have strongly objected to the civic corporation’s move to classify crosses on public properties as illegal structures. “The entire blame for the mess rests squarely with the civic legal department,” said Godfrey Pimenta, vice-president of the Bombay East Indian Association. “It is unimaginable that protected religious structures, which are in existence even prior to the birth of the Bombay Municipal Corporation (BMC) and are listed as heritage structures, are now suddenly deemed illegal by the BMC,” he said. There is nothing more blasphemous than the present categorization done by the committee that has labeled almost every religious structure within the BMC limits as illegal. Pimenta said if the government could accord status of protected structure to residential and commercial premises in existence prior to January 1, 1995 and subsequently extended to January 1, 2000 then why the same cannot be granted to all religious structures. Pimenta alleged that the municipal commissioner had been kept in the dark about the legality of the structures and hence the notice of December 28 terming all structures as encroachments.